Safeco Field adheres to a Clear Bag Policy during selected events. When Walker’s Lockers is present, we make it easy for customers to securely check their items and enjoy the event worry-free. Walker’s Lockers is the ONLY OFFICIAL AND APPROVED Bag Check Service at Safeco Field. We carry Liability and Bailee’s insurance to protect your property while it is in our possession. Bags and items of nearly all shapes and sizes are accepted. From pocket knives to suitcases, and anything in between, we will do everything we can to accommodate your needs. 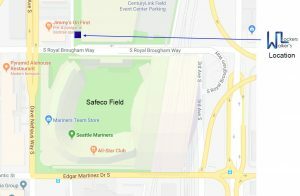 You will find our trucks north of Safeco Field near the corner of S Royal Broughham Way and Occidental Ave S (outside front entrance of WaMu Theater). Be sure to look for the Black, Blue, and White Walker’s Lockers trucks, banners, and logos to ensure you are checking your items with the right partner. The times listed below represent the scheduled start and end times of the event. Our service opens 3 hours prior to the event’s start time and closes 1 hour after the event ends. Thank you for using Walker’s Lockers! Check in your personal items, check out our personal service.